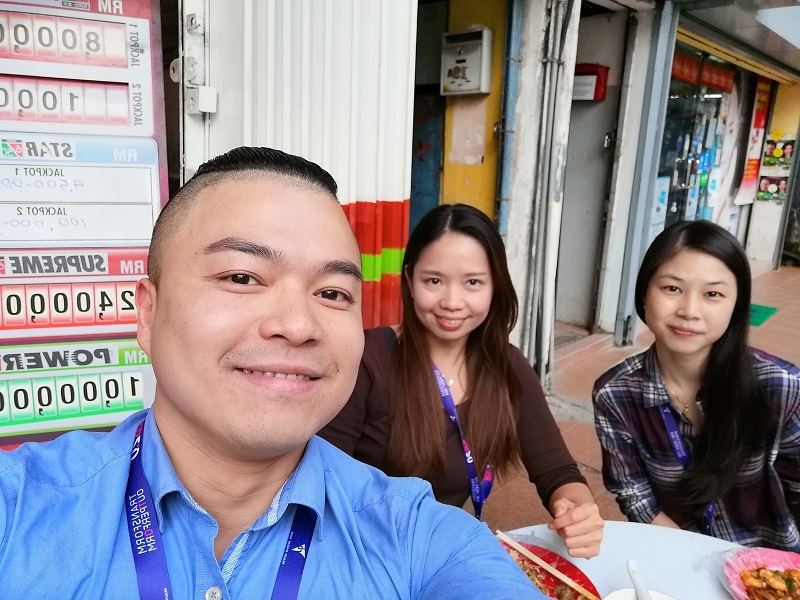 Who wants to sit under the blazing hot sun on uncomfortable stools strewn by the sidewalk with loud motorbikes and cars zooming inches away from you while you eat a plate of CKT? Surprisingly, quite a lot of people. 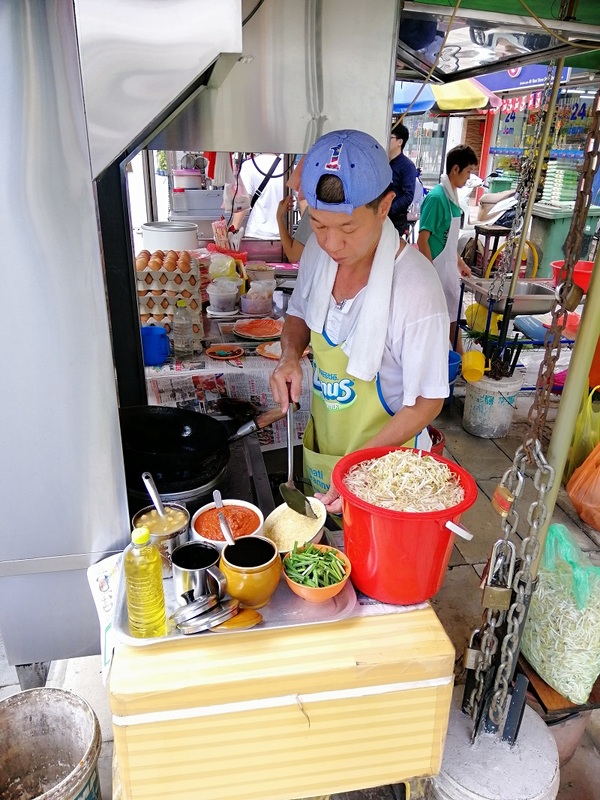 I’m not sure if the exhaust smoke adds to the flavor but this no-name stall in Brickfields is packed during lunch. Or so it seems when it was at the sidewalk opposite. Now that it’s at a roomier five foot way, it doesn’t seem that crowded. 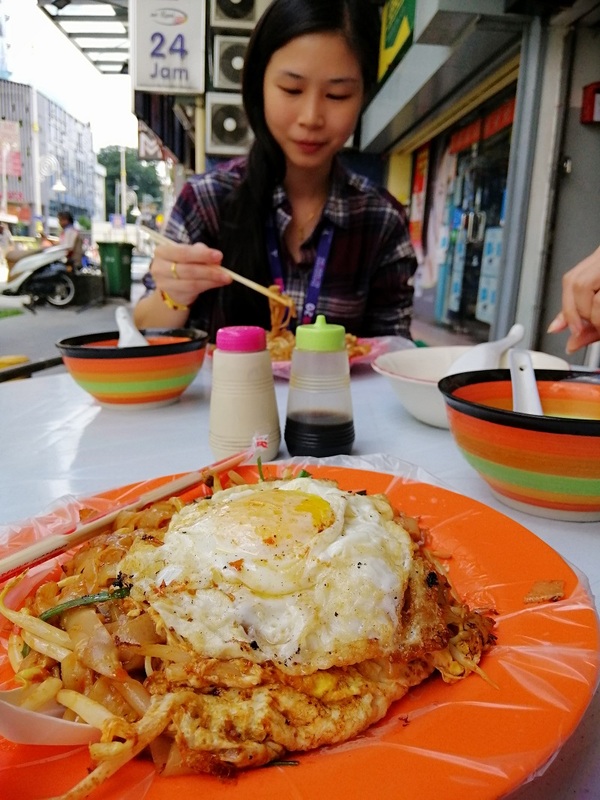 I’ve been wanting to eat here and my adventurous lunch kaki and her friend jio me today. 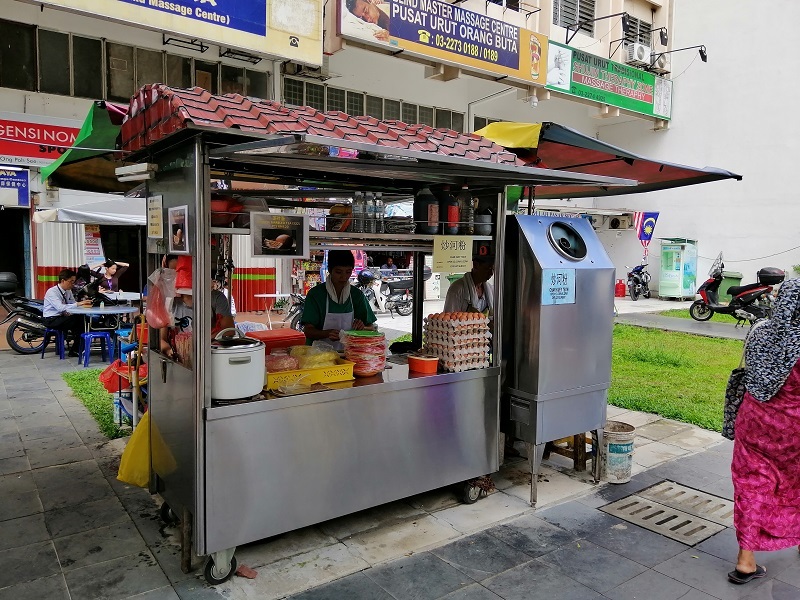 Brickfields Char Kuey Tiaw is just a stall built with corrugated sheets at a pedestrian sidewalk near my office. It’s a mystery how a place like this received operating permits. I imagine it was grandfathered in back in the days coz you never see stalls like this outside of a permanent structure now. The famous cendol in Brickfields is located right beside it. You need a certain type of person to appreciate the CKT here. 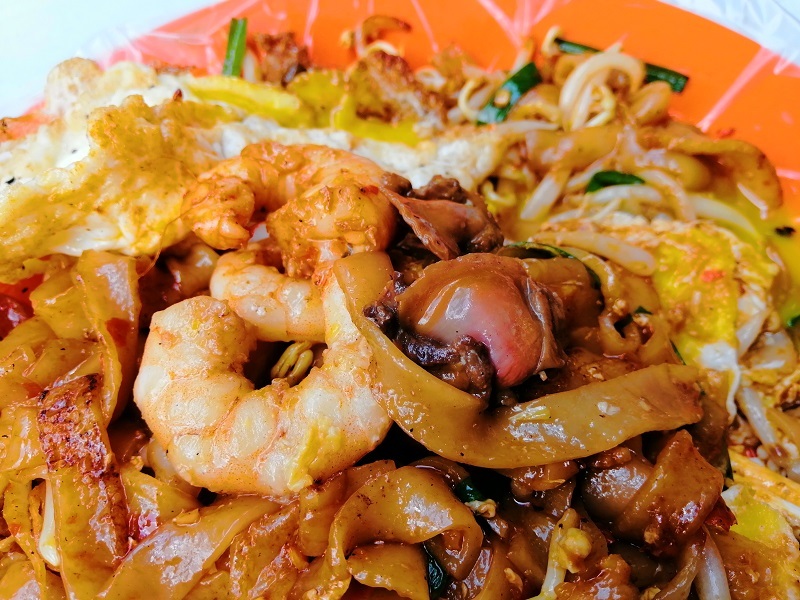 If you insist on air-conditioned comfort, Brickfields Char Kueh Tiaw is not for you. It’s sweltering hot, very noisy and quite uncomfortable. I have to admit, I did wonder why people want to put themselves through this. I’m not a huge fan of getting soaked with sweat and walking around for the rest of the workday with BO. But I wanted to try it. They fry each plate of CKT individually and have a sign stating they’re open from 12:03 pm – 9:32 pm. I thought that was hilarious. The cendol is slightly salty due to the unsweetened (or salted?) coconut milk. I like it but one of my lunch companions didn’t. I think the slightly salty cendol is nicely balanced. It’s a lot more interesting to eat this than a one-dimensionally sweet cendol. 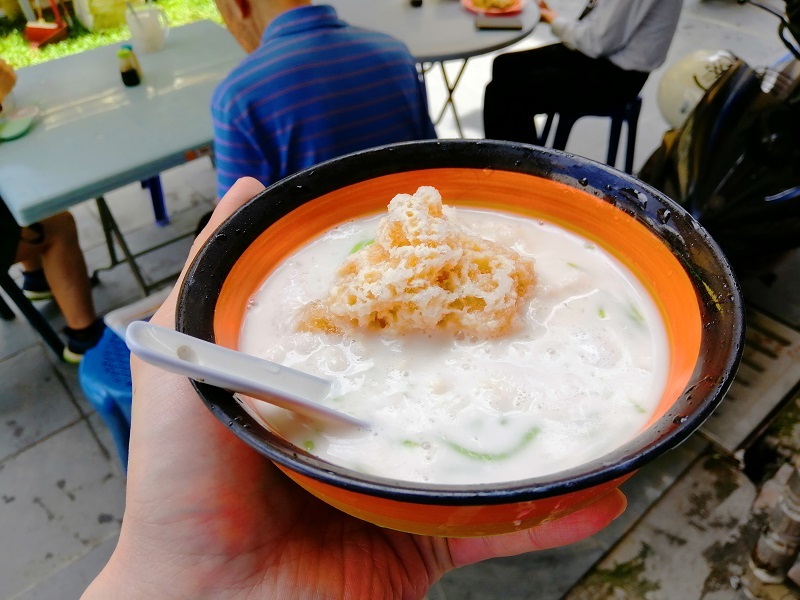 Your taste buds are a lot more interested and engaged with a sodium tinged cendol. 8/10. I ordered the CKT with an extra fried egg (RM 8). I had been warned that the CKT here is not the dry wok hei type of affair. It’s a slightly soggy and moist plate. You will likely be let down on your first bite. The taste creeps up on you. There’s prawns, siham, lap cheong, and crispy fried pork lard – all the ingredients that’s supposed to be in a plate of CKT. I prefer eating rice with lots of meat so maybe my verdict is slightly colored by my penchant for flesh. I’m inclined to be more carnivorous during mealtimes to get my protein macros in. It’s not a bodybuilding thing, I’ve always liked eating lots of meat products. Taste wise, it’s alright but not the best plate of CKT I’ve ever had. I give it 5/10 but you may like it more if you enjoy eating CKT.